This year, the Delridge Neighborhood Development Association (DNDA), in conjunction with the King County Food and Fitness Initiative (KCFFI), hosted Delridge Day: FRESH, the 4th annual all-day celebration with this year’s focus on community, local and fresh food, an active lifestyle and the arts. For the first time, Delridge Day featured a micro-farmers’ market produced by Tiny’s Organic Farm. The day featured performances by local musicians such as Amos Miller & Friends, Seattle Fandango Project’s Quetzal, and Canary Sing. Youth programs ALL-ACCESS and the Food Education Empowerment and Sustainability Team (FEEST) each showcased their work, and neighborhood collective TEAM Delridge presented their ongoing community assessments in the areas of food resources and built environment. FEEST produced a Battle of the Chefs, a mentor versus youth cook-off, with local celebrity judges. Partnering artists Jeromeskee of Massive Monkeys, Jonathan Matas, Mandy Greer, the sew people, and others facilitated ongoing, interactive art projects and workshops accessible to all, including: break dancing, public mural, community crocheting, DIY fashion, and more. 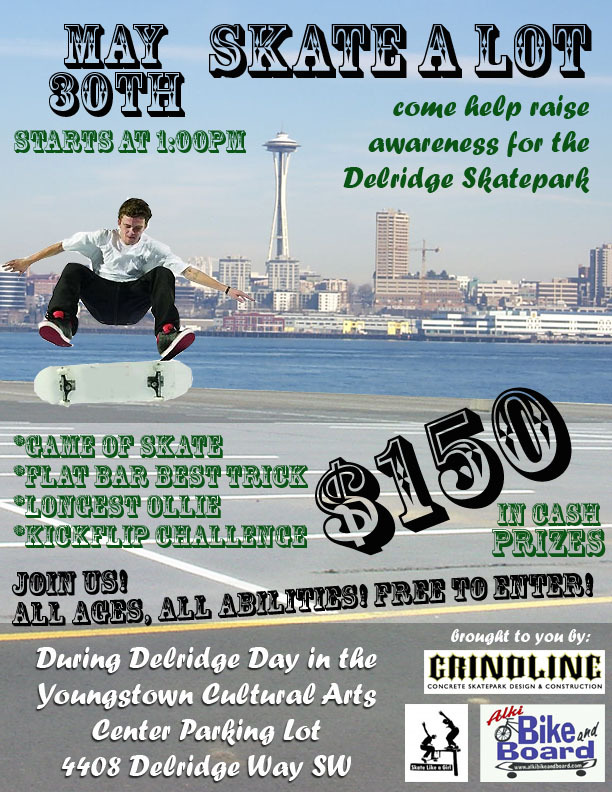 Local non-profit Youth in Focus hung their photography in the Promenade of the Center, and in anticipation of the Delridge Skate Park to be located at Genesee and Delridge Way, the Skate Park Art Advisory Board was on hand to discuss plans for the park and put on fun and interactive skateboarding activities. The outdoor mainstage hosted a variety of family-friendly musical talents in partnership with The Vera Project. Local producer Amos Miller, who has collaborated with hip-hop talents Piece Kelley, Choklate, Silent Lamb Project, Vitamin D and Damien Black, showcased his newest material with a cast of musicians, vocalists and dancers including Canary Sing. Also performing was Seattle Fandango Project, featuring members of East LA’s Quetzal, a contemporary blend of Mexican and Afro-Cuban rhythms. In addition, a showcase of youth performances by the incredible young talents of the Youngstown’s ALL-ACCESS program, presenting work from classes in studio recording, break dancing, rock band, and DIY fashion, to name a few. Along with DNDA and the King County Food and Fitness Association, the event was sponsored by Department of Neighborhoods, the Mayor’s Office of Arts and Cultural Affairs, and 4 Culture. This event was free for community members of all ages. Click here for Part 1, Part 2, and Part 3 of photos, videos(! ), and news coverage from The West Seattle Blog.